LodeStar boats are built to last, to the highest standards of quality, reliability and durability for professionals and sporting enthusiasts. 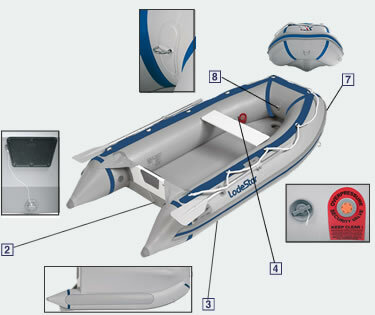 LodeStar produces inflatable boats and RIBs in different materials like PVC and Hypalon®. LodeStar uses a fabric of 7 layers that is immensely strong, DECITEX 1100 and 550. The special coated fabric is UV and wear resistant and is virtually unaffected by weather. We are using Mehler-Haku ™ fabric from Germany and Orca-Pennel® synthetic neoprene rubber fabric from France. In the front, inside of the boat we have two very strong lifting D-rings (davits rings). In the top of the transom we have two special security holes, you can use it as Davits lifting points or you can put a cable through it, so you can chain your property to your boat or even a tree! On the bow outside we have two D-rings for towing and a strong D-handle for haulage. The high-pressure air deck of LodeStar provides a quick assembly, and small storage room. Thousands of X-stitched fibres give the LodeStar air deck 50% more rigidity than any other air deck used by other companies, and the strong fabric enables a real high pressure (.8 bar! ), and surpasses the classic wooden or slatted floors in comfort and weight. The bottom of the tubes and the air-keel are reinforced. LodeStar has a high profile rub strake with integrated spray rail, which give you comfort and security, and add to the good looks and durability of the boat. LodeStar inflatables are equipped with special security/overpressure valves. Excessive tube pressure from sudden impacts or high temperature is compensated and cannot damage the structure of the boat and thus maximises your safety. Reflecting tape on most models on port and starboard, red, green and white, add to your security in darkness and bad visibility. The transom of the LodeStar is on both sides coated with 2 mm deeply infused PVC. There are two aluminium motor clamp plates. On the bottom we find a special one-way transom drain plug. All LodeStar inflatables (except the Quick-roller) are equipped with an (integrated) inflatable keel, which gives the boat a RIB-like look and performance, good directional stability while rowing, motoring or towing. LodeStar offers a limited guarantee of five years on fabric and construction. The guarantee covers for the first two years also the accessories. Our global network ensures a fast and first class service support wherever it is needed. If you are looking for the best you end up with LodeStar. LodeStar boats are proven Dutch design. We are also uniquely able to offer customised solutions to our customers who want to match their tender(s) to a specific wish or design. LodeStar private label boats can offer additional security and personalised features you will not be able to find by any competitor. Product innovation is the core of our business and success. LodeStar stands for quality, security and durability.